You'll be £28.00 closer to your next £10.00 credit when you purchase British Warship Recognition: The Perkins Identification Albums. What's this? The Richard Perkins warship identification albums form one of the most detailed studies ever undertaken of the changes to the appearance of Royal Navy ships. However, it is a unique hand-drawn manuscript artefact in the care of the National Maritime Museum, so despite its value it is rarely seen by anyone besides the museum’s curators, for whom it is a precious resource, used on an almost daily basis. In collaboration with the Museum, Seaforth is undertaking the first publication of this monumental work in a superbly produced multi-volume edition that captures all the qualities of the original. Every page is reproduced at full size, making the extensive hand-written annotation readable, while the fine-line drawings retain all the colours that Perkins used to denote appearance differences and alterations. 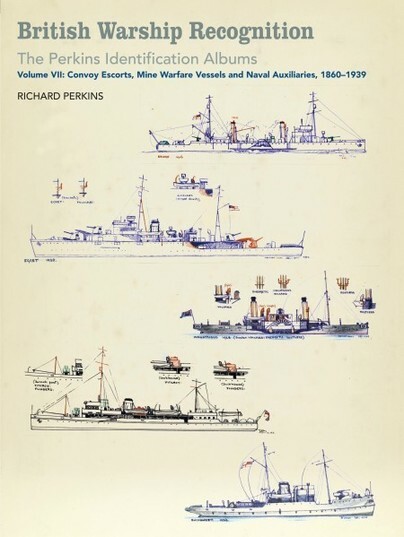 This final volume of the series reproduces all the remaining material from the Perkins albums, covering convoy and minesweeping sloops of the Great War era, interwar escorts, mine warfare vessels, and important naval auxiliaries, like survey ships, depot ships and Admiralty tugs. It even includes the sketches and unfinished material that form an appendix to this mammoth undertaking. This is a publishing event of the utmost importance for every enthusiast and ship modeller, who for the first time will be able to own a copy of a unique and invaluable reference work. Recommended for the maritime expert, ship artist and collector. A masterpiece of incalculable value without which today we could not have information on the countless British warships that sailed the seas. Volume seven covers convoy escorts, mine warfare vessels and naval auxiliaries from 1860 to 1939. Here again we have some of the more humble elements of the navy – but Mr Perkins was intent to illustrate that they all counted. We learn how his knowledge of ships great and small was often called upon to assist with ship identification, but he would rarely stick his neck out. Accuracy mattered more than anything to him. Although conceived for the purpose of identifying ship images, what Perkins' albums actually provide is the most thorough and comprehensive record of British warship appearance ever achieved. that is available nowhere else. It will be an absorbing source for those developing an interest in the subject and it provides a unique visualization of the developing naval technology from 1860 to the outbreak of WWII. The detail and sheer level of detail held within the book as a whole is once again simply amazing. The hand written tables and notes, all in the authors hand written work is all clear to read and simply beautiful... Individually the series of books are a delight to see and now we have the complete set makes a magnificent reference. A major archive reference which Seaforth and the National Maritime Museum have made such a marvellous collection available to everyone.